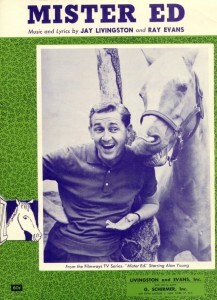 Mister Ed, a TV show starring a fictional talking horse, first aired in syndication from January 5 to July 2, 1961 and then on CBS from October 1, 1961 to February 6, 1966. The theme song was written by the songwriting team of Jay Livingston and Ray Evans and sung by Livingston. After using only the instrumental music to open the first seven episodes, a decision was made to replace the instrumental-only version with one containing the lyrics. Livingston agreed to sing it himself, at least until a professional singer could be found; however, the producers liked the songwriter’s vocals and used them on the broadcast.